Within a social-ecological framework, environmental approaches may include multiple, complementary activities within a site or organization. Changes in written policies, organizational practices, and the observable (physical or “built”) or communications environments may include the adoption and implementation of new or enhanced organizational practices, rules, or procedures that make healthy choices easier and more desirable. Examples of such activities may include marketing and promotion of healthy foods and activities, greater accessibility and convenience to purchase or select healthier foods, healthier food-service policies, participation in wellness councils, point-of-choice prompts to action, and access to recreational facilities. In the Environmental Settings level of the framework, the focus is measuring changes in policies, systems, and environments (PSE) and complementary promotional strategies in SNAP-Ed qualified sites and organizations. This level corresponds to SNAP-Ed Approach 2 as defined in the Food and Nutrition Act: comprehensive, multi-level interventions at multiple complementary organizational and institutional levels. To what extent does SNAP-Ed programming facilitate access and create appeal for improved healthy eating and physical activity choices in the settings where people eat, learn, live, play, shop, and work? Program implementers and evaluators seek to learn whether SNAP-Ed’s influence in creating organizational changes, policies, rules, marketing, and education make healthier choices easier and preferred. The initial goal of the evaluation is to assess whether healthier choices are available and appealing. Some of these changes may result from organizational partnerships or individual champions. If PSE changes are made with fidelity to research- or practice-based models, we can expect individual-level outcomes (as defined in the previous chapter) to improve. Eventually, evaluators could also measure changes in individuals at these settings, using the indicators in the previous chapter, if desired. Changes can occur within and across sites and organizations to prompt healthy behaviors. Layering different types of complementary activities within a single organization or site helps to maximize impact (Riley et al., 2010). Facilitating changes across an organization—that is, similar changes across multiple school sites within a school district and preschool or afterschool programs, or complementary changes with reinforcing nutrition messages among a chain of food retailers or changes across a company with multiple field facilities that employ working parents and caregivers—are examples of more comprehensive approaches that are known to amplify results. HealthMPowers – Featured in the SNAP-Ed Strategies & Interventions: An Obesity Prevention Toolkit for States, schools in the HealthMPowers’ program implement a variety of complementary activities—some of which are SNAP-Ed funded and others funded by the school—to create healthier settings for students, staff, and families. 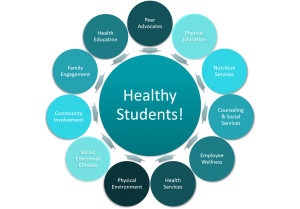 This “whole school” approach emphasizes the link between health and student achievement. Specific PSE changes include integrating physical activity into the school day and conducting the School Health Index to identify the strengths and areas for improvement regarding health programming and policies at their school. Learn more at: http://healthmpowers.org/. An example of a whole-setting approach is applied in a school setting in Georgia (shown above). Schools are a prime setting for implementing multi-level interventions for obesity prevention; many SNAP-Ed services are delivered in schools. To be most effective, policy, systems and environmental interventions should be combined with other activities or components that reflect the needs and readiness for PSE change within an organization. Additional components of PSE change may include evidence-based education, marketing, parent/community involvement, and staff training on continuous program and policy implementation. Ongoing or continuous evaluation of PSE changes and their respective additional components are necessary to assess long-term organizational effectiveness and maintenance of PSE change. The primary role of SNAP-Ed Implementing Agencies is to provide initial assistance, consultation, technical assistance, and a supportive inter-organizational infrastructure to help create appropriate organizational or environmental changes that benefit low-income households and communities. It is ultimately the responsibility of the participating site or organization to adopt, maintain, and enforce the changes. * Low-wage SNAP-Ed worksites are defined as industries generally classified by the Bureau of Labor Statistics as low-wage, with at least 25 employees, and whose human resources department or management confirms that more than half of workers earn annual wages comparable to 185 percent of the federal poverty level for the state. RE-AIM (Reach, Effectiveness, Adoption, Implementation, and Maintenance) is a useful model for planning and evaluating the dissemination and implementation of evidence-based interventions. Indicators in the Environmental Settings level of the framework reflect a modified version of the RE-AIM model. For SNAP-Ed purposes, agencies would measure reach and adoption by the people and organizations/sites that could and do offer evidence-based interventions, then implementation of the essential components, effectiveness in terms of checks on progress, and lastly maintenance using the definitions shown below. Sites where there is identified need or readiness for changes in organizational settings or policies, or associated organizational or staff readiness for adopting PSE changes has been assessed. Champions who have engaged in efforts, outside of the delivery model of the SNAP-Ed program, to improve access or create appeal for nutrition and physical activity supports. Partnerships with service providers, community or organizational leaders, and SNAP-Ed representatives in SNAP-Ed settings where people eat, learn, live, play, shop, and work. The number of people who encounter the improved environment on a regular basis and are assumed to be influenced by it. When organizations make at least one change in policy or practice to expand access or improve appeal for healthy food and beverages. These may include, but are not limited to, those in SNAP-Ed Strategies and Interventions: An Obesity Prevention Toolkit for States. Adoption does not mean that full-scale implementation has occurred. Whether the intervention was delivered with fidelity or as intended and whether the essential elements known to be important to the achievement of positive outcomes were actually and consistently implemented. To be effective, organizational policy changes and environmental supports should be made as part of multi-component and multi-level interventions to sustain the new changes or standards over time. Achievement of the intended outcomes. Implementation and effectiveness are closely linked since the quality of implementation will directly affect the outcomes achieved. At the environmental level, effectiveness is defined as, and is measured by, improvements in the food environment and/or organizational changes, policies, rules, marketing, and access that make healthy choices easier. Increased environmental assessment scores provide objective, systematic evidence of documented environmental improvements. Relates to the number and average percentage increase of SNAP-Ed qualified sites or organizations with a plan in place for staff, training, procedures, diversified funding, human and facility resources, and other maintenance-of-effort essentials. May include measures of institutional resources invested in nutrition and physical activity supports or standards in terms of paid and volunteered/redirected staff (number of fulltime equivalents), cash, or in-kind supports, as well as spin-off projects, unexpected benefits, and return on investment.